I am in love with everything pastel this spring and lavender is no exception. This color makes me feel just like an Easter egg and I like it. LOL. I just want to say that I have on lavender lipstick and fingernail polish as well. I may have gone too far, but I was having so much fun in this color. I trotted around in this look today while I was running errands. I must say it's super comfortable. Style Notes: So I got this from the Boohoo plus range. They only go up to a UK 20 and so that's the size I got in the top and bottom. This line would be considered jr. plus sizes which sizes slightly smaller than regular plus sizes. This skirt did have some give so I was able to work with it. I do wish, however, that the skirt was longer. A midi, in my opinion, should be around 29 inches, this one was only 25. These pieces also came in mint, cream, and black. Very cute. Does this skirt have any stretch? Super cute and I am glad you posted this because I have both of these pieces in my cart but was hesitant to bite. I've been wishing for pastels so I decided to go for it. Looks good on you. The peplum sets it off just right. I think you look amazing! This is one of your best looks!!! And I love the lipstick on you too!!!!! Thank you...this is one of my fav looks as well. You look so cute. The pastels make me happy! I also really like the texture of the outfit. I spy the striped Asos coat in the background. I am waiting out my no shopping days to buy it! Me too...and yes that is...I haven't decided what to wear with it yet. loving this combo and i love how light the lavender is! Love the look with the peplum! Beautiful Chasity!!!!! 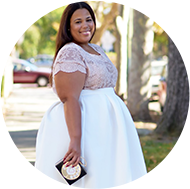 You look good on the peplum and I love the texture of the outfit and thanks so much for featuring on my blog. I checked out the site and they go up to a UK 24/US 20, is this the size you got? Really wanting to order the mint color as I am obsessed with bomber jackets but concerned with sizing. If you don't mind my asking, what size do you usually wear in skirts? I ordered the US 20. I can wear up to a 24 usually in skirt and I have the waist taken in. Yes, a midi skirt will be more apreciate !!!! but the color is so lovely! You look sooo beautiful! The color is just perfect on you and I love the quilted effect of the skirt and jacket.